I’m also looking at: spell balancing, combat balancing (melee attacks can now attack first! ), cosmetic changes, new collections, collection completion rewards, and bug fixes! If you can help me with this you will have: My sincere gratitude, a credit in version 1.2 as “VBA Coding Support”, and version 1.2 released sooner to everyone as I can save time from failing at this repeatedly! Thanks! Please let me know what you think about the upcoming changes and if there are things that you want to see make it into version 1.2! Hello. Thanks for a superb game 🙂 Could you please add a diagonall movement for total 8 ways to move? Thanks and keep doing your great work. Thanks for the feedback. Movement limitation to 4 directions was a design decision. It allows for more strategic arena environments as enemies can move in 8 directions but the player can only move in 4 directions. 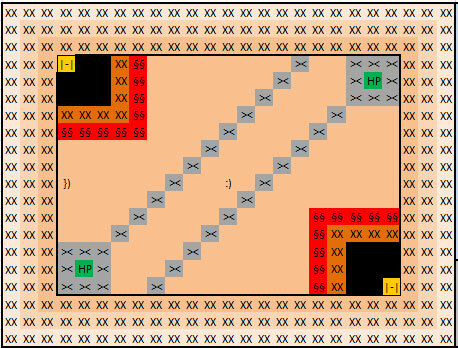 If the player can move in 8 directions it can 1) run away from an enemy indefinitely without much strategic thinking. 2) can navigate certain arenas way too easily. So with that in mind, I’m going to keep it to 4 directions unless you can provide feedback as to why that is a poor design decision. Thanks! Hi. It is OK if it was intended. I found one “bug” – when I am standing in the middle of battlefield at position K11-P11 and an enemy is approaching from the left, he gets stuck at F12 and cannot go further, which is pretty easy to kill him. I have not been able to replicate this, are you sure the enemy was not exhausted which is why it could not move? Didnt save the game. Probably was something else. I also cannot replicate the same conditions either. I was thinking that a decent enhancement might be to rank the Hall of Fame entries by the number of turns it took to complete the game. Obviously, incomplete games would be ranked by Fame below the complete ones, but this would give a better indication of how well each game was played and a better goal to shoot for, increasing replay value. At the moment, the total Fame you can get can barely vary from game-to-game since all games stop at level 35. Basically if you have a weapon with a fame modifier bonus, you can get a little higher, but that’s it. I’ve played through from start to finish a lot of times, and really the measure of how well I did is how quickly it went more than anything else. Thanks again for an awesome game! No problem! The other new changes sound awesome as well. Looking forward to it. I just wanted to let you know that I needed to push this feature to version 1.3 to get 1.2 out sooner. However Version 1.3 will also include a new Statistics feature that will gather this information and much more such as total enemies killed, most used spell, highest damage attack, etc.